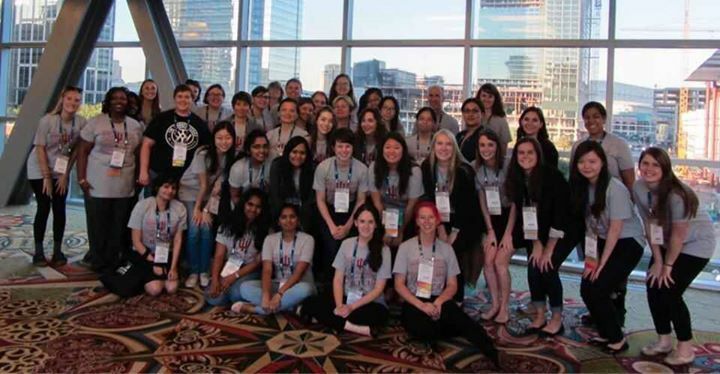 Students from the School of Informatics and Computing at IU and IUPUI had a great time at the Grace Hopper Celebration of Women in Computing! Great example of the kind of informal connecting that occurs on Facebook. Have you ever asked anyone if they “linked in” lately? No? Not surprising. I’ve been a member of LinkedIn for a couple of years, but am not active. It’s a very business-like site, which is appropriate since it’s for professionals and businesses. The personal profile is like a super resume with places for your work experience, education, hobbies, interests, extra classes, skills, certifications, and more. Then, like Facebook, you can look for people to connect with (which is like friending) and businesses to follow. You’ll have feeds, somewhat like Twitter, based on interests that you check. Potential jobs are also fed to your page, although I’ve found them to be a little off the mark. One thing that I like about LinkedIn is the focus on learning and self-improvement. Everything is focused on helping you move forward in a career so it doesn’t feel like you’re just wasting time. There’s a large independent learning platform for brushing up on office/business skills and that’s a great help for anyone who needs additional training. This is a good place for finding trainings and webinars which allow learning on your own schedule, and updating skills which need a bit of polish. There isn’t much for photo sharing, and the discussions have a friendly, but business-like tone. One thing that’s very different from Facebook is that you have to be invited to join. It’s also not as easy to find connections (friends) as it is on FB. Once you do find people, LI sends an invite in a similar way to FB, but it sends it to the person’s email address, not just their LI account. Facebook, on the other hand, is all about fun and socializing and being funny and/or entertaining. There isn’t much on FB that is focused on learning or self-improvement. It has a much more “right now/in the moment” kind of feel, as opposed to LinkedIn which feels more like building a portfolio over time. Much of FB is about sharing photos of fun times, inviting people to events, and providing a communications link to groups or remote family members. For librarians, LinkedIn is a good place to network with other professionals for career connections, but you wouldn’t want to let your hair down and you won’t be connecting with your patrons there. Facebook provides a more informal environment to relate to patrons, post events and photos, and be a little more approachable. LinkedIn is a “maybe this is helpful” place to work on growing a career – Facebook is a “must have” place for libraries to remain reachable and relatable. Gaming and Muve in the Library – Why?